Today’s enterprising chefs have a multitude of ways to crack the competitive culinary market—a food truck, for instance, or a Smorgasburg stand, or a stall in one of the ever-proliferating food courts. 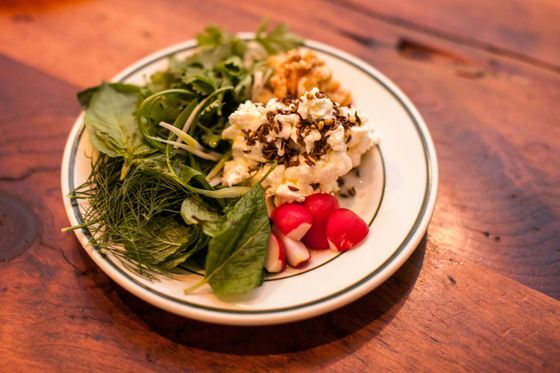 And then there’s the trusty pop-up, the occasional meal staged in a borrowed setting and designed to road-test a concept or lure investors for future ­permanent locations. The chief attraction of the pop-up is its limited availability, with the promise of an ephemeral taste of one passionate cook’s seldom-seen handiwork. Hence Brooks Headley’s foray from fine-dining pastry into meat-free patties at Superiority Burger, Mark Ladner’s penance for decades of durum-wheat devotion with the gluten-free Pasta Flyer, and Ivan Orkin’s waters-testing, oversubscribed ramen engagements at Momofuku Noodle Bar, which set the stage for his grand New York entrance. This fall has seen the arrival of two enticing if much more low-key pop-ups, both love letters of sorts to their creators’ heritages. Chef and cookbook writer Louisa Shafia grew up in Philadelphia with an Iranian-expat father and only began channeling that side of her culinary legacy in her 30s. 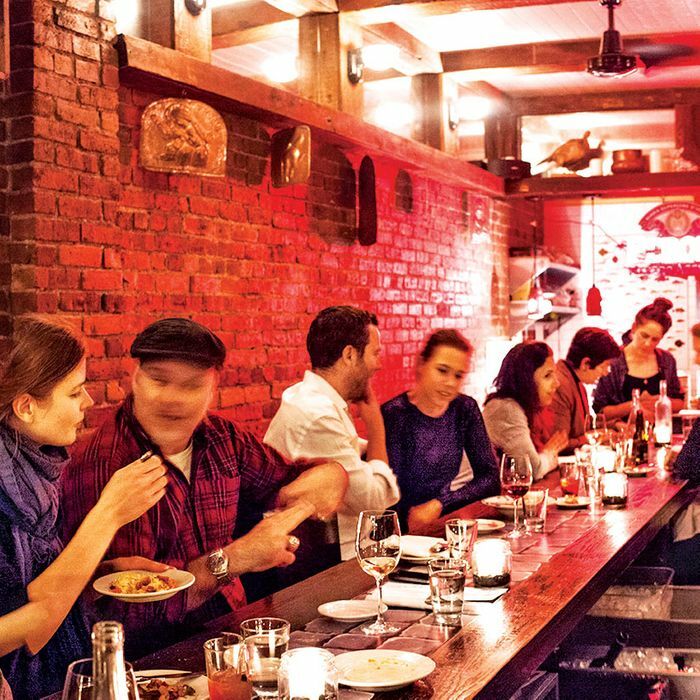 The result: last year’s lauded The New Persian Kitchen, an exploratory trip to Iran, and a weekly East Village pop-up ­dedicated to the food she experienced on that gastro-pilgrimage. 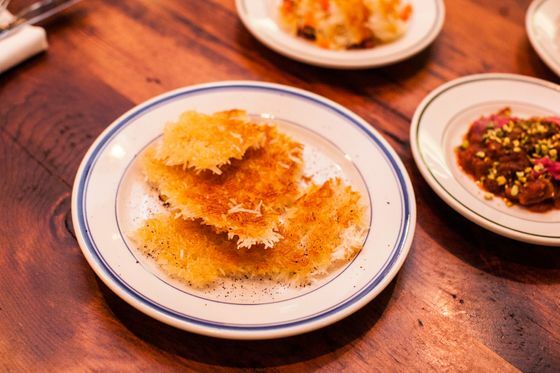 Shafia launched Lakh Lakh, named for a rice-and-fish dish native to the Persian Gulf region, this fall at Porsena Extra Bar and will continue it through the end of this year and into the next. 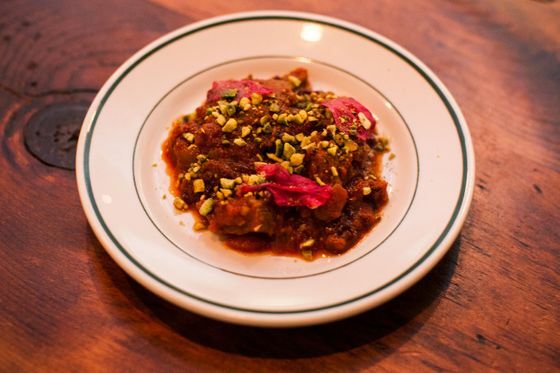 Most Monday nights, she transforms classic Iranian street food and home cooking into a series of small plates, priced from $5 to $8, and serves them at the 22-seat bar to the accompaniment of a soulful Iranian soundtrack and the chatter of grateful expats. 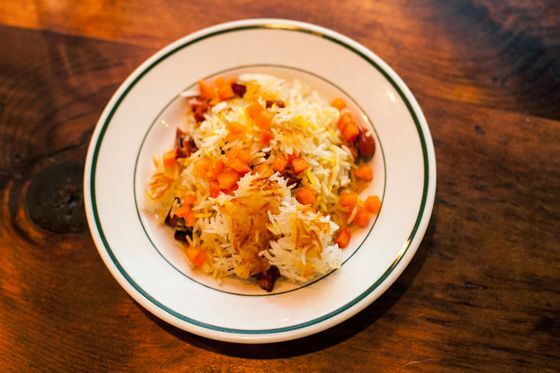 In Shafia’s hands, aromatic stews and boldly seasoned rice dishes become a Persian-tapas gateway into the ancient cuisine, one distinguished by pistachios and pomegranates, saffron and sumac, yogurt and lamb, and more fresh herbs than seems possible in late-autumn New York. She makes elegant, cheffy tweaks to foods she sampled abroad, substituting flaky phyllo for bread dough in crisp pies called sambuseh and spiking their spicy tomato relish with fresh ginger. Her Azerbaijani-style borscht—a reflection of Iran’s proximity to the former Soviet republics—is likewise brightened with red-wine vinegar and lime. Each week brings a different kebab: one bite-size skewer of saffron-tinged chicken, say, or pomegranate-and-walnut-marinated lamb, or the cult favorite lamb’s liver propped on flatbread. The worthy effort to use sustainable fish like mackerel in a dish combining saffron and sautéed onions can be undermined by flavors that don’t quite coalesce. But Shafia’s stews never fail to satisfy—the long-cooked meats studded with fruit and nuts are best accompanied by an order of the rice of the night, dotted with things like sour cherries or roasted persimmon. Dairy is also a highlight, be it the oiled-and-spiced feta beside a thatch of aromatic herbs; savory or sweet yogurt, seasoned with everything from beets to barberries; or the ice-cream sandwich, a familiar treat rendered exotic via ultrathin housemade cardamom wafers. Collerton cooks her Anglo-Indian curries from memory, reverse engineering desired spice effects and applying them to the local and seasonal ingredients she and Fidanza favor. Summer pop-ups showcased fresh shell-bean dal and a peach-and-tomato salad dressed with curry vinaigrette; fall has brought an incendiary turnip-cauliflower curry, garnished with sweet-and-sour cipollini. Collerton cares less about authenticity than about unique flavor profiles, hoping that her firm, subtly spicy Swedish-size meatballs taste different from her soothing yellow dal. (They do.) Basmati rice and condiments make fine accompaniments—especially a bright and fragrant coriander sauce with the texture of salsa verde. Saltie is known for its pickles, but Mr. Curry’s are made in the oilier Indian fashion; on the beverage side, the shop’s seasonal lassis and turmeric tonic segue from day to night. And Saltie regulars will recognize the blistered, pan-cooked naan from the Clean Slate sandwich. A bit stiffer than its tandoor-baked brethren, perhaps, but liberated from daytime duties to swab up an English expat’s edible taste memories, it still does the trick. Hours: Monday 5:30 to 10 p.m. Ideal Meal: One of everything, to share. 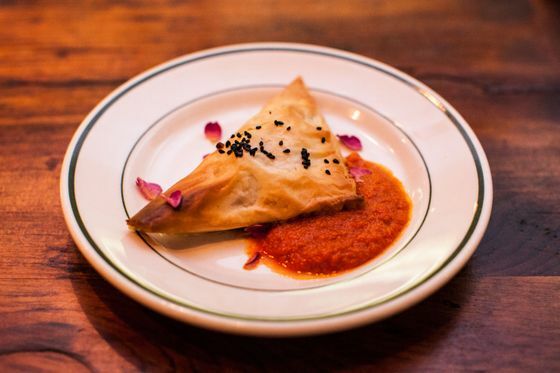 Note: Shafia serves Persian-themed Prosecco drinks in addition to the bar’s wine and beer. Scratchpad: Two stars for the rotating small-plates menu and another for the homey spirit. Hours: Thursday through Saturday 6:30 to 10:30 p.m. Ideal Meal: Dal, rice and pickle, and quince lassi, plus Saltie’s Eccles cake for dessert. Note: There are only eight stools and a bench, but Mr. Curry does takeout too. Scratchpad: One star each for the pickles, the curries, and the condiments.